A significant portion of my postodoctoral work is finally out in the last issue of Cell (link to paper). In this study we have tried to assign a function to post-translational modifications (PTMs) that are derived from mass-spectrometry (MS). This follows directly from previous work where we looked at the evolution of phosphorylation in three fungal species (paper, blog post). We (and other groups) have seen that phosphorylation sites diverge rapidly but we don't really know if this divergence of phosphosites results in meaningful functional consequences. In order to address this we need to know the function of post-translational modifications (if they have any). Since these MS studies now routinely report several thousand PTMs per analysis we have a severe bottleneck in the functional analysis of PTMs. These issues are the motivations for this last work. We collected previously published PTMs (close to 200.000) and obtained some novel ubiquitylation sites for S. cerevisiae (in collaboration with Judit Villen's lab). We revisited the evolutionary analysis and we set up a couple of methods to prioritize those modifications that we think are more likely to be functionally important. As an example, we have tried to assign function to PTMs by annotation those that likely occur at interface residues. One approach that turned out to be useful was to look for conservation of the modification sites within PFAM domain families. For example, in the figure above and under "Regulation of domain activity", I am depicting a kinase domain. Over 50% of the phosphorylation sites that we find in the kinase domain family occur in the well known activation loop (arrow), suggestion that this is an important regulatory region. 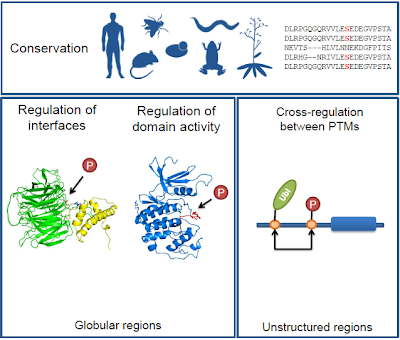 We already know that the activation loop is an important regulatory region but we think that this conservation approach will be useful to study the regulation of many other domains. In the article we give other examples and an experimental validation using the HSP70 domain family (in collaboration with the Frydman lab). I won't describe in detail the work as you can (hopefully) read the paper. Leave a comment or send me an email if you can't and/or if you have any questions regarding the paper or analysis. I also put up the predictions in a database (PTMfunc) for those who want to look at specific proteins. It is still very alpha, I apologize for the bugs and I will try to improve it as quickly as possible. If you want access to the underlying data just ask and I'll send the files. 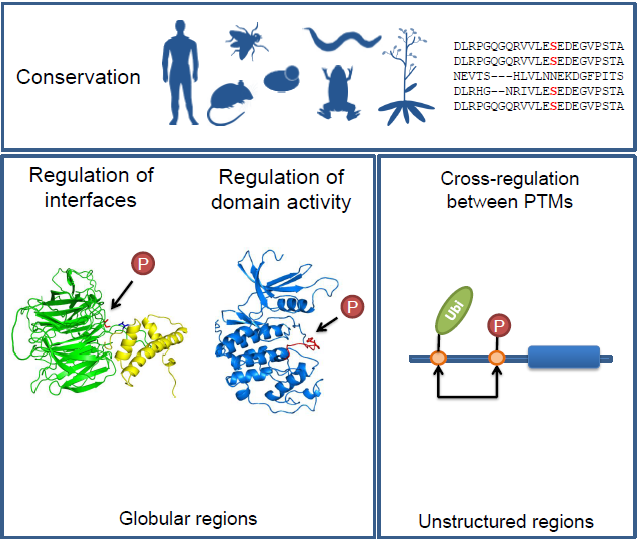 I am also very keen on collaborations with anyone collecting MS data or interested in the post-translational regulation of specific proteins, complexes or domain families. Having a blog means I can give you also some of the thoughts that don't fit in a paper or press release. You can stop reading if you came for the sciency bits. One of the cool things I realized was that I have discussed in this blog three papers in the same research line, that run through my PhD and postdoc. It is fun to be able to go back not just to the papers but to the way I was thinking about these ideas at the time. Unfortunately, although I try to use this blog to promote open science this project was yet-another-failed open science project. Failed in the sense that it started with a blog post and a lot of ambition but never gained any momentum as an online collaboration. Eventually I stopped trying to push it online and as experimental collaborators joined the project I gave up on the open science side of it. I guess I will keep trying whenever if makes sense. This post closes project 1 (P1) but if you are interested in online collaborations have a look at project 2 (P2). This work took most of my attention during the past two years and it is probably the longest project I have worked on. Two years is not particularly long but it has certainly made me think about what is an acceptable publishable unit. As I described in the last blog post, this concept is very hard to define. While we probably all agree that a factoid in a tweet is not something I should put on my CV we allow and even cheer for publishing outlets that accept very incremental papers. The work I described above could have easily been sliced into smaller chunks but would it have the same value ? We would have put out the main ideas much faster but it could have been impossible to convince someone to test them. I feel that the combination of the different analysis and experiments has more value as a single story but an incremental approach would have been more transparent. Maybe the ideal situation would be to have the increments online in blogs, wikis and repositories and collect them in stories for publication. Maybe, just maybe, these thoughts are the consequence of postdoc blues. As I was trying to finish and publish this project I was also jumping through the academic track hoops but I will leave that for a separate post.